I was sat in the pub with a couple of fellow rat lovers when “vegetarian kebabs” came into the conversation. Immediately my mind started ticking… how would I make a vegan doner kebab?? 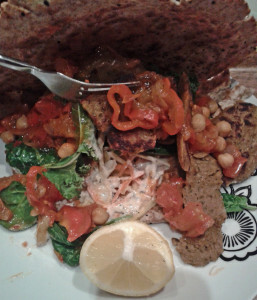 Before my veggie days, I used to love the occasional doner. All those flexible strips of mystery meat, drenched in chili sauce, all wrapped up in an oversized pitta or naan, finished off with a good old dollop of raita or garlic mayo. Mmm, heart attack city! I think the only healthy thing about a proper kebab is the salad that gets served with it! Although my version is perhaps a little on the carby side, I think it makes a much more healthy, nutritious and satisfying treat! 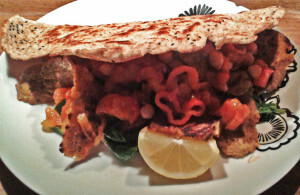 Succulent strips of seitan, fresh chili salsa, creamy mint tahini raita and oodles of fresh salad, all served up in a “pitta-naan”. 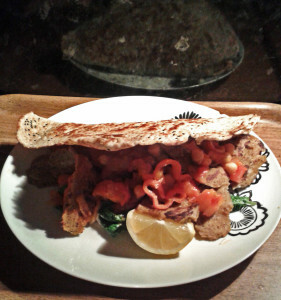 I made 3 kebabs out of the following recipe; however after scoffing one, I am fit to burst! So I reckon you could get 4 servings if your eyes aren’t bigger than your belly. Fill a small pan ¾ full with cold water and crumble in the stock cube. Chop the sweet potatoes into chunks and the onion into halves and add to the cold stock. Heat until the sweet potato is tender. Transfer the sweet potato and onion to a bowl and add a tablespoon of the stock (keep the rest for soup!). Mix in the garlic, coriander leaves, salt, pepper, chili flakes, ground coriander, cumin, cumin seeds, dried herbs, nutmeg and oil and then blend to a thick puree. Add the wheat gluten and garlic powder and mix until a dough is formed. You might need to use your hands towards the end. Knead the dough for at least 5 minutes, longer if you have time (I cheated and used the kneading tool on my food processor). You want the “meat” to be firm and kneading is the key to this. Using your hands, try to mould the kneaded dough into a fat, smooth sausage shape. Then roll up in foil and loosely scrunch up the ends. Put in a steamer for 1 hour. After one hour, remove from the steamer and leave in the tin foil until cool enough to handle (about 45 mins). 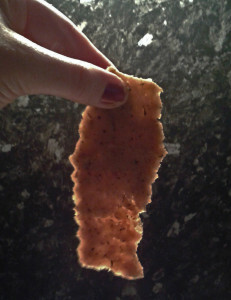 Slice the seitan “loaf” as thinly as you can, in order to create meaty “shavings”. When you’re ready to serve up your kebab, quickly fry in a pan with minimal oil, just to heat through and brown off the edges. Sprinkling of black onion seeds (optional). Put the yeast and sugar in a jug and add the water. Put somewhere warm for 20 mins. A frothy head should form. In a bowl, mix the flours and then add the oil, garlic and wet yeast mix. Stir until combined and then use your hands to sculpt a dough. Knead until elastic-y then pop into a bowl, cover with a clean tea-towel and pop somewhere warm for an hour. Dough should roughly double in size. Knead the dough for a further 5 minutes then divide into 4 equal pieces. Roll each piece into a ball then flatten. If you are using the black onion seeds, sprinkle a teaspoon or so into a bowl and dip each side of the dough into them. Roll out each piece of dough until it is as wide as the frying pan you are intending on using (about 10 inches in diameter). One pitta-naan at a time, fry one side until golden brown (use minimal oil). Then, flip over and fold in half to create a “taco” shape. Fry each side of the taco until golden brown then place on a plate and cover with a clean tea towel. I find this method means that the bread is less likely to break when you try to fold over to create your kebabs. Using the same method, cook the remaining 3 pitta-naans. Thoroughly mix all the ingredients. Simple! You can use your imagination here and make the sauce as mild or as fiery as you like. I basically chopped up a few tomatoes, a few mini red peppers, some garlic and some chilies and mixed with a tablespoon of fresh lemon juice, a teaspoon of sugar and a teaspoon of salt and left for half an hour. The mixture was then added to fried onions and heated until bubbling. I also chucked in a few chickpeas for good measure. Again, there is room to use your imagination here. I grated carrot, swede and celery and added to thinly slice white cabbage, kale leaves and baby spinach. Iceberg, red onion and red cabbage would also make a welcome addition. 7. Garnish with a wedge of lemon and finally, attempt to eat. Warning, its messy! The omni hubby actually reached over, stole and ATE a piece of the seitan without me asking him to try it! AND he said it looked and tasted exactly like doner meat and that the texture was closer than he ever would have thought!!! MASSIVE complement coming from him! So there you have it, my vegan doner kebab, served on a “pitta-naan”.